My brother and sister in law are currently embroiled in a debate as to what device she’ll be getting to use primarily for reading eBooks. I may catch a little flack from him on this review, because the new Nexus 7 is definitely the device she should get (he wants her to buy an iPad). A more detailed review can be found below, but I’ll sum it up for you. 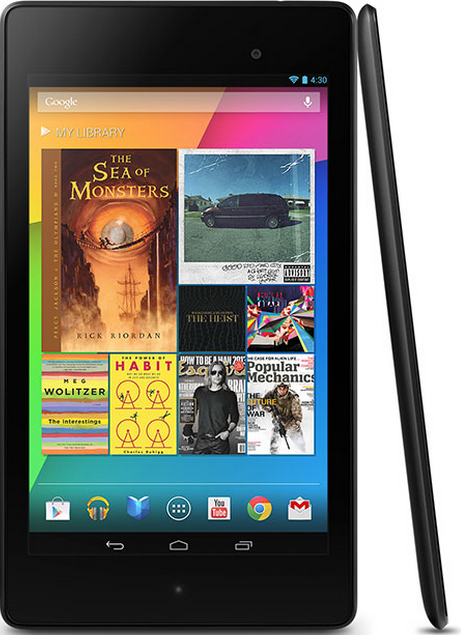 The new Nexus 7 has the highest ppi screen (323) on the market. It’s easier to hold than a paper-back book, it’s responsive as heck. Put all that together, and you’ve got one killer device. The only weakness I’ve found of any significance with the new Nexus 7 is that the battery life isn’t that great (though it isn’t horrible). Average use, you can expect a day and a half to two days use. In short, my sister-in-law should get this thing (bring on the flack). This screen is gorgeous. The color reproduction isn’t perfect, but it’s kinda close, and the clarity is unsurpassed. I defy you to find a pixel with your naked eye. At 323 ppi at 1920 x 1200, you’d have to have some insanely good vision. Take a minute to think about that ppi number. It means that there are 323 tiny pixels crammed into each square inch of that screen. The iPad with Retina Display, for comparison’s sake, boasts only 264 (which is still a very good number). This Nexus 7 beats it by around 18%, which isn’t an insignificant amount. That iPad has a very, very good display, but the Nexus 7’s is just a bit better. Will Apple beat 323 ppi with their next set of tablets? Maybe, but it sure won’t be this inexpensive, and it won’t change the fact that this screen is downright awesome. The sharpness and clarity isn’t just pretty, it’s better for your eyes. Here’s an article from when the Retina iPad came out that explains more. The new Nexus 7 feels pretty sleek. The Corning glass feels awesome, and the back has a nice, and somewhat grippy rubberized texture. The buttons aren’t up on the very edge of the device (near the screen), but down a bit on the curve (you’ll know what I mean when you pick one up) which takes a little getting used to, but they’re fine after a few presses. There’s still no SD card slot (booo), but the micro USB port supports USB OTG, which means you can get a little USB adapter for less than $4.00 and plug in external storage if you want (you may need an extra app to do so). In short, if you’re low on space, just move some movies and comics to an external drive and plug it in when you need it. It’s also very light, which is good for a tablet you can hold with one hand as it won’t fatigue your wrist. In other words, it doesn’t feel like a Ferrari–it’s rubberized plastic and glass, but it does feel sleek and sturdy. It’s well made, and very nice to hold. This thing runs Android 4.3, which is pretty sweet. I’ve covered Android before, so I’ll leave it at this: the operating system is extremely customizable and has a wealth of apps to choose from. It seamlessly integrates your personal data (as much of, or as little as you want) between your various devices (computer, phone, etc.). The above can also be said for the other mobile platforms–even Windows, which has significantly fewer apps (if you’re talking RT), but can generally get the job done. Yes, iOS has a higher quantity of tablet-optimized apps, but quantity isn’t everything. Most of the apps I use on a daily basis have a tablet optimized version, and the ones that don’t have one coming soon. Android phones have access to more apps than iPhones total, but that doesn’t mean that the selection on Android is significantly better (unless you’re looking for emulators). What I’m getting at is that I think the app situation between these two giants has become something of a wash in most cases. The exceptions to that are things like iOS tending to get things like games first, while Android has far more customization apps to choose from (like my examples of changing your launcher to make the phone look and feel more like iOS or Windows Phone). This thing is awesome. I work with, test, and use a whole lot of devices at work. I get to play with all of the major new tablets as they launch, and have a good idea of what each can do. If battery life is the most important consideration for you, you might be want to pick a different tablet (like an iPad with Retina display–MUCH better tablet than the Mini). But the battery life isn’t all bad–it won’t keep you tethered to a wall socket all day long, and it can charge extra fast with a QI wireless charger (just put it down on the charging mat–no need to plug in). If you’re OK with the battery life (which isn’t the worst in its class), then you will love the rest, and the tablet is totally worth buying. My company, OverDrive, is in the business of digital media–eBooks, audiobooks, music, and video. I read a ton of eBooks, and I’ve done so on a ton of different screens. It makes me extra sensitive to display quality, and let me tell you, there isn’t a better tablet out there for reading. 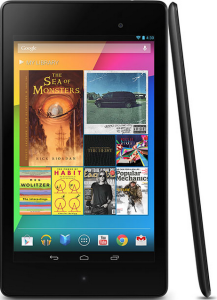 If they stepped up the game this much on the Nexus 7, I can’t wait to see the next iteration of the Nexus 10. UPDATE: Apparently the new Nexus 7 is pretty durable too. People have been trying to break it.